Women in Black are holding a vigil for Syria this Wednesday 27 July, 6pm at the Edith Cavell Memorial, St Martins Place, London. Instead of bombs, send aid to Syrian women civil society activists. 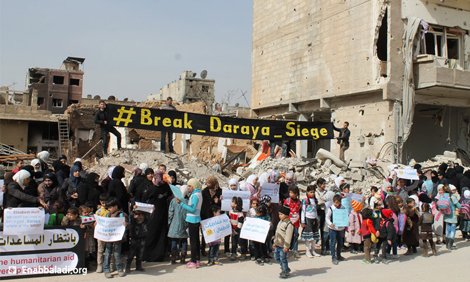 Earlier this year women in Daraya and other besieged Syrian communities facing starvation called for help to break the sieges. The promise by the UK and other governments of humanitarian airdrops to besieged communities has since been broken, and instead Daraya has come under increased attack by the Assad regime, with farmland bombed and crops destroyed. And with renewed attacks on the city of Aleppo, as many as 400,000 more people have now come under siege. The war in Syria has taken a huge toll of life and wellbeing. Out of an original population of 23 million some 470,000 have been killed and 6.26 million displaced internally and 4 million abroad. YET—despite all the odds, and defying our imagination, civil society lives on in Syria, with women activists in the lead. Research by the Badael Foundation, a Syrian non-profit and non-governmental organisation published last year, surveyed 28 women’s civil society groups involved in peace-building activity, none associated with the regime or with violent groups. Questionnaires to the groups, plus interviews with 35 women leaders and 10 focus groups with 100 women activists, revealed many women’s peace-building activities: reducing the spread of small arms in IDP camps; preventing the recruitment of children by armed groups; mediating to resolve conflicts between villages or within camps; bringing members of all groups, including those of perpetrator and victim, to mourn each death. These women activists revealed in Badael’s report are all urging an internationally-brokered peace based on the Geneva 1 Communique of 2012, with unconditional ceasefire followed by negotiations. They call for women's full participation as required by UN Security Council Resolution 1325, to produce transitional justice and a new constitution for a Syria that will be pluralistic, democratic and gender-equal. Working for peace incurs risk, because some on both sides see such women as traitors. They are most limited and threatened in the more violent regions, where they daily risk detention, torture, sexual abuse and assassination. Women in Black holds vigils every Wednesday between 6-7 pm at the Edith Cavell Statue, opposite the door of the National Portrait Gallery, St.Martin’s Place, London WC2. The vigils are silent, women-only and if possible we wear black. Donations for leaflets most welcome.